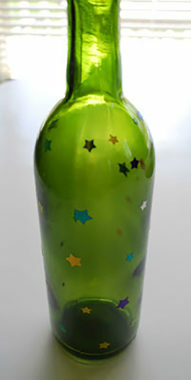 Apply star stickers to a clean bottle. A clear bottle is probably the most ideal, for the star bottle. I only had one clear bottle (I don’t drink too much white wine), so I had to use a green bottle too. I used both paper and plastic (clear back) stickers and found the the plastic stickers were easier to remove. If you have the option, I would suggest the plastic stickers that have the clear backing. Spray 3-4 light even coats of spray paint. I used Krylon, Oxford Blue, in a satin finish. Let dry and remove stickers. 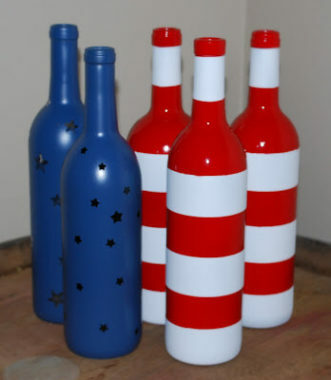 Spray the desired number of bottles, with 3-4 light even coats of white spray paint. I used the plain old white color from Rust-Oleum, in a flat finish. 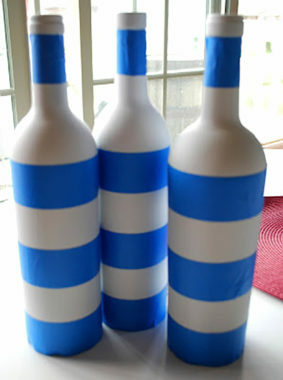 Apply painters tape around the bottles. To get the straightest line, it’s easiest to place the tape on the parts of the bottle that are not curved. Shocking, I know. I tried my best to place the tape in the same position on each bottle, so that they would line up when placed together. Spray a few, light even coats of red paint. I used the red color from Rust-Oleum, in a glossy finish. Let dry and remove painters tape. I wasn’t quite sure how these would turn out, when I started, but I was pleased with the outcome. I like the combination of the different paint finishes (satin, flat and glossy), it adds a little more character. The Rust-Oleum brand spray paint is my spray paint of choice. It coats the best, requiring less coats and I’ve never had the spray nozzle get clogged.